Los Angeles has a weird relationship with water. Most years there isn’t enough rain to support the region’s population, agriculture and industry without importing it from surrounding areas. Some years there really isn’t enough. And some years there’s so much rain that floods are a greater threat than drought. Other parts of the river are much nicer, even navigable at times, but this stretch really is just a concrete drainage ditch inside a bigger drainage ditch. Unfortunately what’s needed in flood years ends up hurting us in drought years, sending too much of the rain we do get into the ocean instead of collecting it. In recent years they’ve been testing systems to recharge groundwater reserves, but if drought becomes more common — and indications are that it will — we’re going to need to revamp the system. Back to the photo: This was taken last weekend at the Los Angeles Walk for Food Allergy. This year’s event took us around the CBS Studios lot past soundstages, streets made to look like different parts of the US, production buildings, prop/set storage, and yes, the river. The event raises funds for FARE, an organization dedicated to food allergy research, education, awareness and advocacy. Food allergies can range from mild to life-threatening — yes, people die — and those of us on the far end of the range need to be constantly on the watch for hidden ingredients and cross-contact between foods we can eat and foods we can’t. FARE funds studies to explore the causes of food allergy and develop new therapies. They run outreach programs to make it safer to visit restaurants, or just be at school or the workplace. Donations are still open if you would like to contribute. There are 15 million people living with food allergies in the US alone, and your contribution can help all of us. 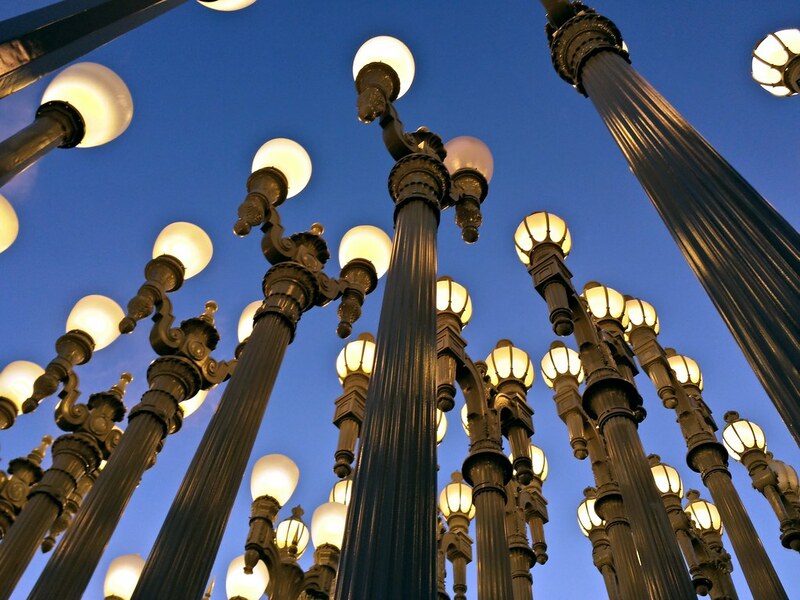 Urban Light at LACMA is a large square filled with over 200 lamp posts that the artist collected from various locations over several years, spaced wide enough to walk through comfortably. It’s like being in a forest of lamp posts — perfect for this week’s challenge. The funny thing is, I wasn’t even planning on going there. We went to see the La Brea Tar Pits and Page Museum at the other end of the park. Oil has been seeping out of the ground for thousands of years, trapping animals and preserving their bones in an incredible collection of ice age fossils. But the parking lot on that side of the park was full, so we parked in the LACMA structure at the other end. 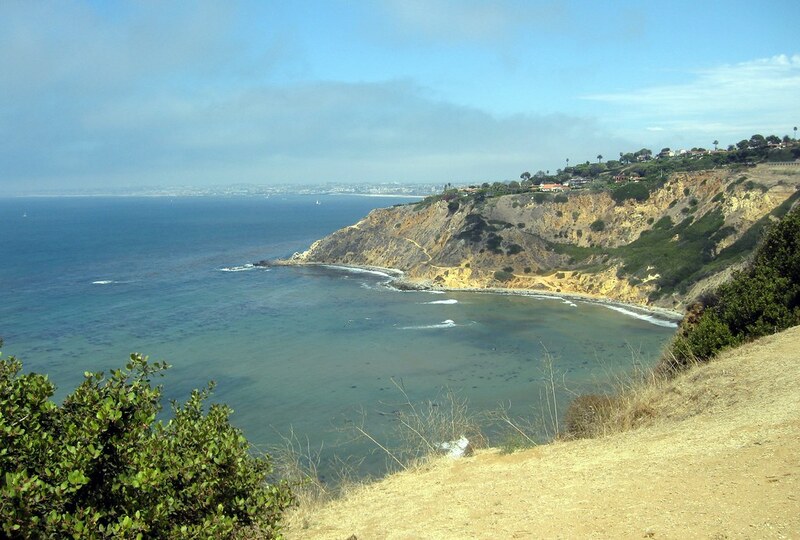 The Palos Verdes peninsula sits at the southwest corner of Los Angeles. Parts of it are built up in old, grid-style suburbs. Other parts are of the more modern, winding type. And still other parts remain open space, due in part to the unstable geology of the area. Parts of Portuguese Bend are sliding toward the ocean, requiring frequent repairs of the main road along the coast. Way back in 1929, a housing development began sliding into the ocean. Abandoned now, the area remaining above land is known as the sunken city. 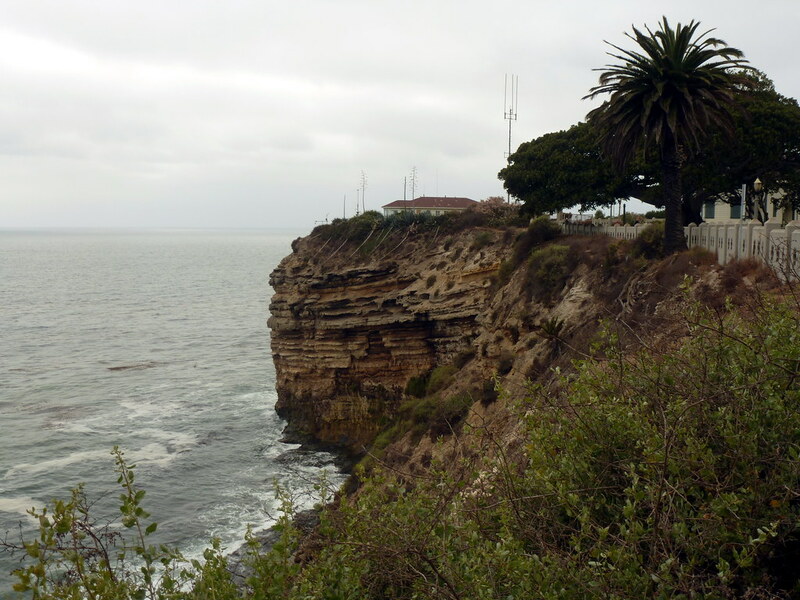 Adjacent to those ruins is Point Fermin Park, an ordinary city park that sits atop the cliffs. The Point Fermin Lighthouse (previously featured here) looks over the sea, and a fenced walkway runs along the length of the cliffs. Looking out here, you can see the layers of rock, and understand how parts of the point could just slide away. The warning signs on the fence don’t surprise me, but I have to wonder just who would want to climb out there. 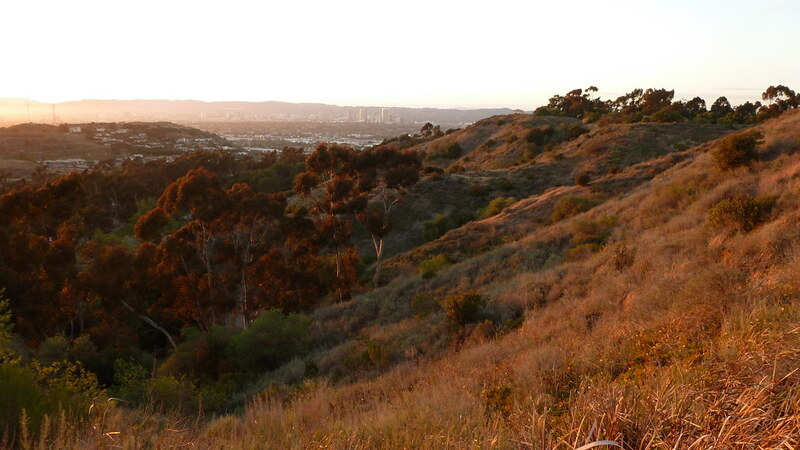 Kenneth Hahn Park sits within the Los Angeles basin, half of a cluster of hills bisected by La Cienega Blvd. The western side is an oil field. The eastern side is broken into a maintained city park and something vaguely resembling wilderness, all of it surrounded by suburbs, homes, retail outlets and light industry. 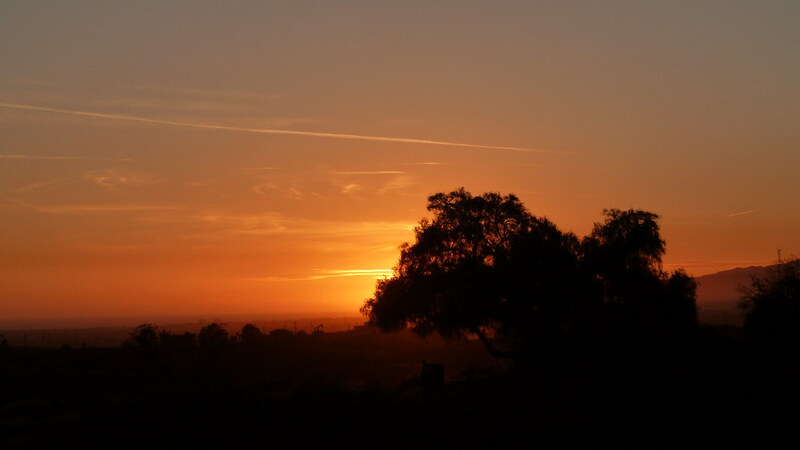 Trails run up into the hills, with benches at scenic viewpoints making it possible to have a picnic lunch while you look across the basin to see — depending on which viewpoint and how clear it is that day — Downtown Los Angeles, Hollywood, Santa Monica, the South Bay or the Palos Verdes Peninsula. This is somewhere along the trail on the western side of the hills, looking north through the valley. I believe the line of buildings in front of the Santa Monica Mountains is Wilshire Blvd. At Hahn Park in Los Angeles, looking west toward Santa Monica and Malibu. 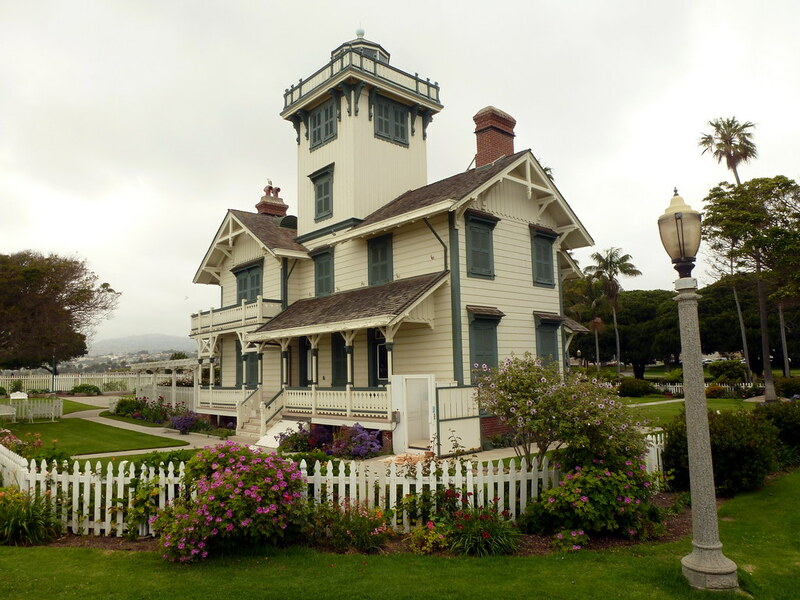 Point Fermin Lighthouse in San Pedro, California, at the southern tip of Los Angeles. The Victorian lighthouse is surrounded by a city park, and the park is lined with a walkway along the top of the cliffs by the sea. Off to one end is the infamous sunken city, a suburban development that was abandoned when the land started sliding into the ocean. I took a whole slew of photos as I walked along the clifftop, and you can see the seven best on Flickr. This is one of three in the area that I considered driving to over the weekend for Instagram’s weekend hashtag project (theme: lighthouses), figuring it had the best chance of clear weather. No such luck. Strangely, the phone picture I chose for the project turned out to be more striking than the better shot taken with my camera. I was trying to keep the lamppost separate from the house, but it turned out I shouldn’t have. I’m always surprised when that happens, even though it’s not that uncommon an occurrence. 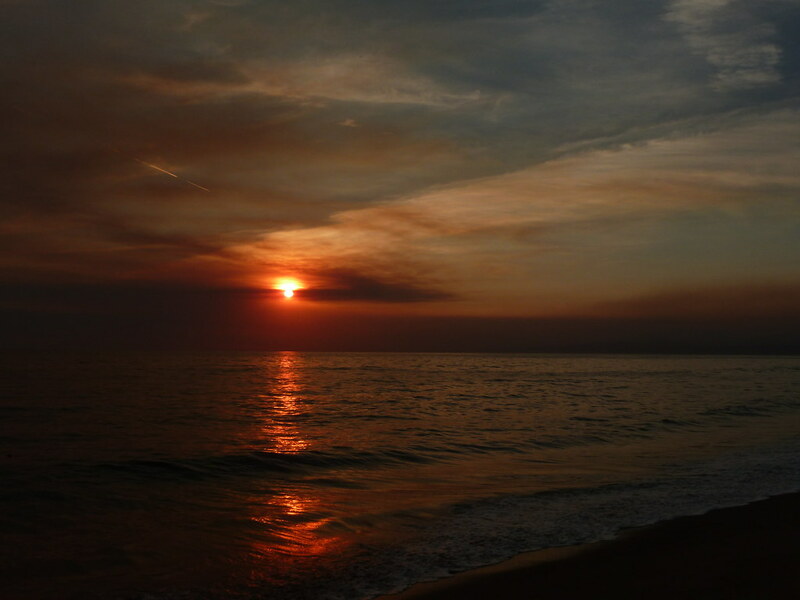 Last Friday I went out to the beach to watch the sun set into the smoke layer from the Springs Fire and other wildfires burning near Los Angeles. More photos from this evening on Flickr. Bluff Cove in the Palos Verdes area near Los Angeles. One of these days I’ll get around to hiking that trail down to the base of the cliffs. 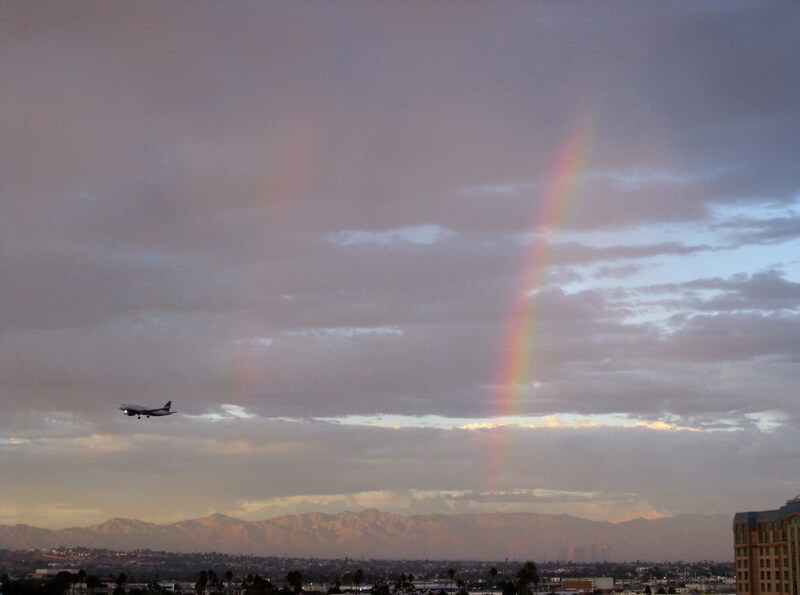 I was on the top of a parking structure near LAX to take pictures of the clouds, and was just about to head down when I saw a fragment of the primary rainbow appear. I decided to stick around and keep watching, and was rewarded when it brightened and lengthened, and then a faint secondary bow (just to the right of the airplane) came into view. 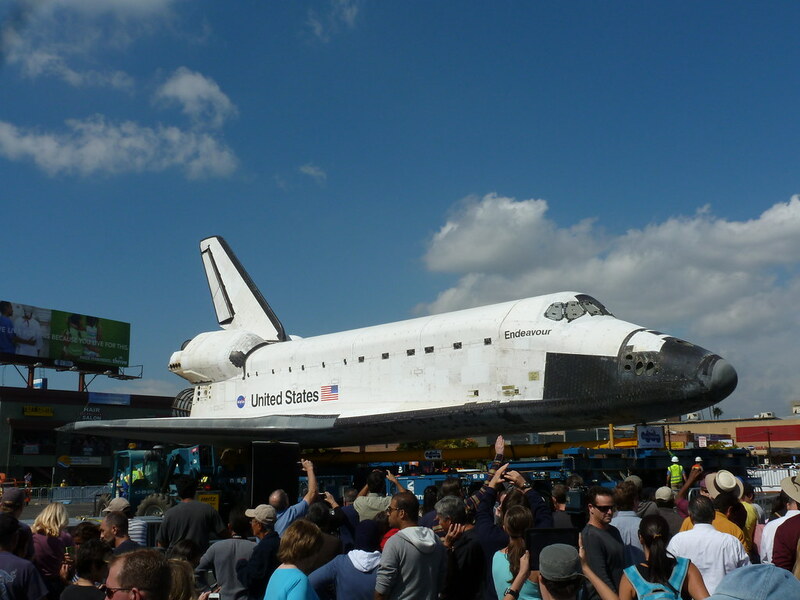 Space Shuttle Endeavour and crowds in Los Angeles a few weeks ago. I was fortunate enough to be able to visit the space shuttle up close while it was stopped at a shopping center parking lot on its way from LAX to the museum. » More photos & writeup.